Hello world! You are right to be tongue-twisted if it's your first time learning about this country. It does not pop-up everywhere and is nowhere near you (I s'pose). So just to get familiar with this cryptic island, take a quick crash-course in History and Geography, will ya!? Mauritius, politically speaking, the Republic of Mauritius, is a small volcanic island (about 2000 km2 - deal with it, we use the metric system) off the southeastern coast of Africa, around 1100 km east of Madagascar. It was uninhabited for most of its existence but had brief visits of the Arabs and the Portuguese in the late 15th/early 16th centuries. It was the Dutch who started a real, though small, settlement in the 17th century and even named the island after their ruling prince. The French conquered occupied the island later on after the Dutch abandoned it and remained settled until the early 19th century, when the British took control after several raids to attempt capturing the island. Why bother acquiring such a small island? That's mainly because of its strategic position as a stopover point between Africa and Asia (well, that's the best I can remember from my history classes, over a decade ago). Mauritius gained independence in 1968 and became a Republic in 1992. And oh, Mauritius was home to the dodo some 4 centuries ago. Given that the country was occupied by different colonies during it's history, this has had a major impact on it's cultural development (and so, our snacks!). Since there were no natives on the island, the colonists brought over slaves and labourers with them to develop the island in its early days. There was also merchants and traders who came over, and settled too, as the island started to develop. As such, the Mauritian culture slowly developed from the influence of its multicultural society into what it is today. On the culinary side, Mauritian cuisine is a curious amalgam of Chinese, European, Indian and Creole influences. With no further ado, let's take a look at what this exotic island has to offer you for a snack! Note that in this article I will be introducing you to street foods, because, in my humble opinion, that's where you get the typical and authentic cuisine in any country. Literally 'chilli cake', gato piment consists of onions, ground pulses (dal), dried chilli, coriander and cumin. After being deep fried, these spontaneously become addictive after the first bite. With its outer, crunchy layer and the softer inside, this modest delicacy takes away your day's woes and hints your taste buds of paradise. Best served hot, it might not however be the favourite for those of you who can't stand spicy food. With chilli being one of its defining ingredients, what might get some to a tasty haven can also get other's palate on fire. Originally from India, this one might not be unfamiliar to most of you. It is a rather popular snack in Mauritius, where it usually (but not necessarily) come in 3 'versions ' stuffed with either minced chicken, fish fillet or potato and onions (the veg alternative). Also deep fried, this one has a larger culinary audience since it comes in a number varieties and is also less or not spicy (depending on the ingredients). Meaning 'marvellous' in French, this flour-based disc-shaped snack really lives up to its name. Nothing much elaborate can be said about this simple snack. Severed with a chilli sauce (pictured on top of the merveille stack), it makes an appropriate post-lunch snack during summer. You can opt out the chilli sauce, if your palate can't stand it, for a similar experience. Quick! You're hungry during your trip in town and it's summer-hot, so you need a refreshing drink too. What can you get that satisfies both of your needs and is at the same time Mauritian? This combination is my personal favourite and I like to call it the Mauritian Fast-Food: dholl-puri (bottom right in the picture) and alouda (the drink). Dholl-puris are literally available at every street corner and each is unique and special as it contains the cook's personal recipe. Dholl-puris are basically flat breads stuffed with ground dal. As a fast-food, it's sold as wrap containing rougaille (seasoned tomato sauce with ginger, onions and cumin) and gros pois (lima beans in masala curry) and usually contains other curries (some places even allow you to create your customised dholl-puri with chicken, lamb, fish curry...). As for alouda, it is a cold drink, especially successful in the capital's market (bazaar), consisting of basil seed, milk and ice cream (yes!) which give you the best beverage to accompany your dholl-puri and/or your hot summer day. Your choice of toppings usually include green chilli sauce (for some reason the place I took this picture also had red chilli sauce), salt-chilli powder mix and compote. The latter (third container in the above picture) is a thick bitter-sweet syrup with tamarind and sometimes seasoned with cinnamon and cloves. If you have a sweet tooth (like I do), then you'll obviously find some space in your stomach for this one. Although I doubt it being originally Mauritian, I haven't seen it anywhere else in the world. I call it the Mauritian ice-cream, locally called sobet rapé. It's made of grated ice, topped with flavoured syrups of your choice and sometimes coconut powder. 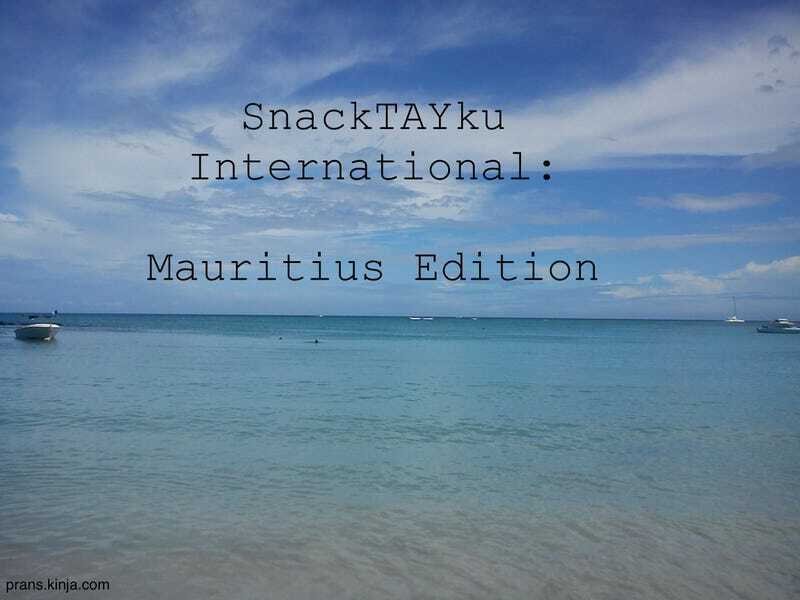 Obviously, your choices of snacks and street foods are not restricted to these but that's basically what I would have whenever I have a quick errand in town (naturally I won't have all of them on one day) and that's what I'd recommend to anyone looking for an authentic Mauritian taste. I hope this introduction to my country's quick bites has been mouth-watering enough to convince you to immigrate take a trip there. If not, I'm not sure we can be friends.